The Sembrando Semillas Project was created in 2005 by the NMAA to address the need to engage younger generations in the continuation of agriculture and land-based traditions associated with New Mexico’s acequias. The project is part of a broader vision of the NMAA to create vibrant communities with locally grown food, healthy families, and secure land and water rights that are all intertwined by cultural identity and querencia, or love of the land. The NMAA has over two decades of experience in advocacy to protect historic land and water rights that are the essential to the resiliency of the land-based culture as well as the agricultural practices that are connected to the acequias. Sembrando Semillas is a relatively newer approach by the NMAA to retain our connections to land, water, and food traditions by transforming both our food economies and our educational institutions and processes. 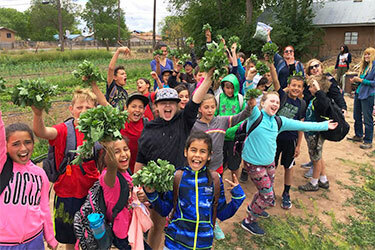 Most recently, the focus of the project has evolved from being a youth-based project to an inter-generational network or learning community, of families, youth, and mentors who work the land and practice acequia agriculture and values. Community-Based Experiential Learning Network. The Sembrando Semillas Network works to cultivate a cadre of acequia leaders of all ages passionate about their identity as land-based people who express their querencia through working the land, sharing water, and growing food. Participants work on agricultural-related projects in their own communities with a strong focus on acequia traditions and values. Within the network, participants learn from each other by exchanging ideas, visiting each other’s projects and communities, and doing hands-on activities together. The 2014 Sembrando Semillas season is supporting a network of intergenerational groups in Chamisal, Mora, Abiquiu, Servilleta, South Valley, Peñasco, and the Española Valley. For more information about this project, contact Juliet Garcia-Gonzales at juliet@lasacequias.org. To view the Sembrando Semillas videos visit their page AcequiaYouth page on YouTube. IF YOU ARE AN ACTIVE SEMBRANDO SEMILLAS PARTICIPANT CLICK HERE FOR THE CALENDAR OF EVENTS.